Microsoft offers Online versions of Word, Excel, PowerPoint, and OneNote as part of the Office 365 account that provides you with your OneDrive storage in the cloud. You can use Excel Online to edit worksheets saved on your OneDrive online right within your web browser. Excel Online is very useful when you need to make last-minute edits to a worksheet but don’t have access to a device on which a copy of the Excel program is installed. As long as the device has an Internet connection and runs a web browser that supports the Excel Online web app (such as Internet Explorer on a Microsoft Surface tablet or even Safari on an Apple iPad or MacBook Air), you can make eleventh-hour edits to the data, formulas, and even charts that are automatically saved to the workbook file on your OneDrive. Launch the web browser on your device that supports the Excel web app and then go to Microsoft Office Online. A Collaborate with Office Online web page showing information about appears. Click or tap the Excel Online button. A Welcome to Excel Online banner appears where you can sign into your Microsoft account. A Microsoft Excel Online tab then opens in your web browser displaying a list of all the workbook files saved on your OneDrive that you’ve recently edited. To edit an Excel workbook file not shown in the Recent list, click or tap the Open from OneDrive button at the bottom of the list. A Recent Documents tab for your OneDrive opens in your web browser. In a panel on the left side of this page, you see a list of all the file folders you have on your OneDrive. The folder you select in this panel displays all the files it contains. Select the appropriate folder and then select the check box in front of the name of the workbook file you want to edit in Excel Online to select the file. When you select the name of the Excel workbook file to edit, the View Details display button is selected (which displays the file name and date last modified in a list), and you click or tap the Details Pane display button as well, the OneDrive page displays the current Share status of the file underneath a list of viewing and editing options in the Details pane on the right side of the page as shown. 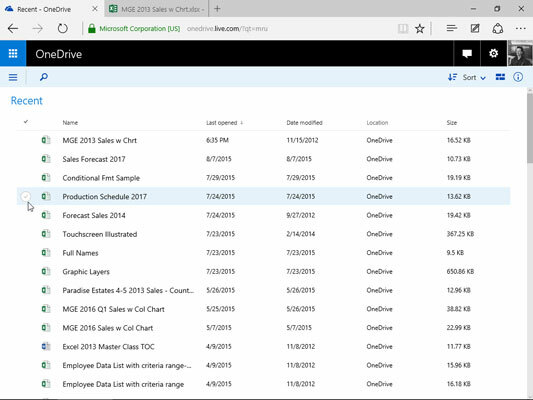 Selecting the Excel workbook on OneDrive to edit online in Excel Online. Click the Open drop-down button followed by the Open in Excel Online option (or simply click the workbook’s filename). Your web browser opens the workbook in Excel Online on a new browser tab (similar to the one shown in the following figure) that replaces your OneDrive page. This workbook contains all the worksheets that you’ve placed in the file with their tabs displayed. You can then use the command buttons on the Home and Insert tabs (most of which are identical those found on the Home and Insert tabs on the Excel 2016 Ribbon) to modify the layout or formatting of the data and charts on any of its sheets. You can also add new data to the worksheets as well as edit existing data just as you do in Excel 2016. 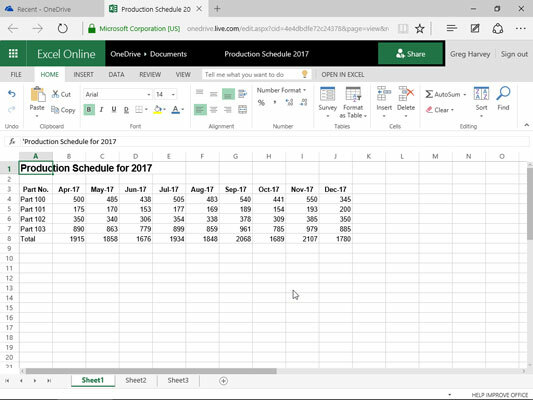 Editing the Production Schedule worksheet in Microsoft Edge web browser with Excel Online. If you want to save a copy under a new filename in the same folder on the OneDrive, choose File→Save As and then edit the filename that appears in the text box of the Save As dialog box before you click its Save button (or select the Overwrite Existing Files check box if you want to save the changes under the same filename). To make modifications to elements in your worksheet unsupported by Excel Online, you have two choices. You can open the workbook in a local copy of Excel (assuming that the device you’re using has Excel 2010 or 2016 installed on it) by clicking the Open in Excel command to the immediate right of the Tell Me What You Want to Do text box. Or you can download a copy of the workbook to your local office computer (where you do have Excel 2016 installed) by choosing File→Save As→Download a Copy and make the more advanced edits to this downloaded copy of the file after you get back to the office. Don’t forget about Microsoft’s Excel app for the Apple iPad and iPhone, if you use either of these devices. The free app is available for download from the App Store (just search for Microsoft Office or Excel). The Excel app enables you to create new workbook files as well as access all the Excel workbook files you store on your OneDrive from your iPad or iPhone.